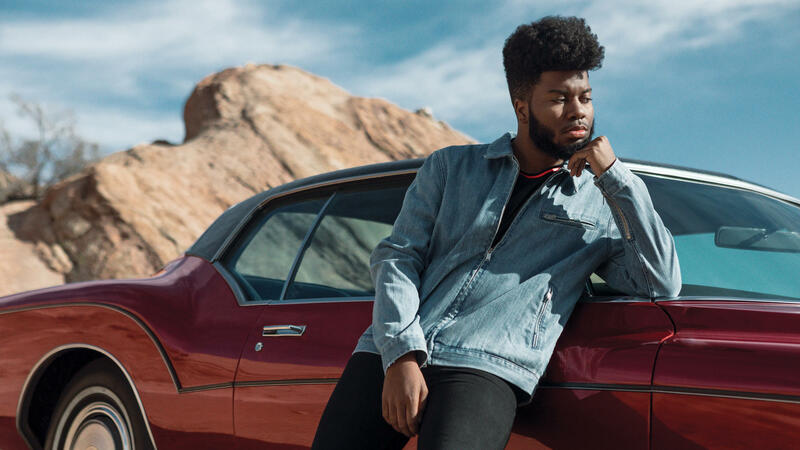 Khalid's debut album, American Teen, explores timeless themes of love and loss. Enter Khalid Robinson with his debut album, American Teen, which he wrote when he was a senior in high school. He has been called a pop prodigy by Rolling Stone and counts people like Elton John among his fans. While his lyrics are very much of the moment, the themes he explores — belonging, love, loneliness, loss — are timeless. And even though American Teen is blowing up the charts, Khalid hasn't gotten too big to credit his biggest influence: his mom, Linda Wolfe, a singer who has performed with the U.S. Army Chorus. They both spoke with NPR's Michel Martin about their bond and about Khalid's music. Hear the full interview — including a spontaneous mother-son duet on SWV's "Weak" — at the audio link, and read on for an edited transcript. Michel Martin: Khalid, you are on tour right now. And I know as an army kid you're used to moving around a bit. But is it a little bit hard to be away from home? Khalid Robinson: It does get a little bit stressful. Because when I used to move around, I moved around with family. Now I'm moving around alone. A lot of the friends I have back home too — we're kinda disconnected, a little bit, but I just can't wait until I have this show in El Paso in around two weeks. Well, you didn't live in El Paso that long, right? Isn't that part of what motivated the album? That you had just gotten transferred at the end of your senior year, which was kind of tough. Robinson: It was very tough. But I felt like it just gave me a sense of realization that I needed, which is the fact that a lot of things that we surround ourselves with are temporary only if we allow them to be. A lot of the old friends that I had in New York were temporary, and they fell off, but I met a lot of lifelong friends in El Paso who helped me and even pushed me to be in the career that I am right now. If I didn't move to El Paso, my life wouldn't be where it is right now. Linda, did you know all this was in him? This gift, these thoughts, these ideas? Linda Wolfe: To an extent. I knew that he was very gifted, vocally. I knew that he was a very smart, bright kid. But the writing skills — I didn't know he had that. DNA's a powerful thing! Wolfe: I am so, so, so proud. Just sitting back here, listening to him and how he just describes his journey — I can see his growth just by the conversation that we're having here. And he's also very honest. Let's talk about "8TEEN." Khalid, anything you wanna share? Robinson: So, I am very honest, and I am very honest with my mom — when I moved out of the house. [Laughs.] My mom and I, we have trust within each other because at one time in our lives, we were kind of all that we had, you know? My mom had me and I had her. And so she let me go out. I didn't really tell her everything that I was doing when I went out, but a mom always knows. I'm pretty sure she knew that I was going out, I was having fun, I was doing stuff that I shouldn't be doing. But as long as she trusted that I was responsible, and I was gonna make the right decisions, I feel like that was all that really mattered. Linda, when you hear this song, especially when you hear it on the radio, do you go "Oh boy"? Khalid, there's something you wrote in the pamphlet of the album: "I sing with the voice of individuals who have a hard time expressing how they feel, the individuals who are just like me. Not necessarily because they don't know how to express themselves, but because they're afraid no one will listen." That's quite a statement. Where did that come from? Robinson: So for me, when I grew up, I never really had an outlet when it came to my social surroundings. Even if I had a form of popularity, I felt like I was very limited. And I felt like when I wanted to talk to either — if it was teachers, a lot of the teachers wouldn't listen to my problems because I felt like a lot of people thought that just because I was young, that my problems weren't problems. I feel like a lot of people keep the fact that — "You know what, youth, they're not really going through anything because they're not 25 yet." But at the same time, a 25-year-old can go through the same form of heartbreak as a 35-year-old, as a 15-year-old. You know? Love crosses all boundaries. And so I felt like it was necessary to talk about the problems I went through when it involved love. Not only just to speak to people who were young, but just to speak to people in general — people who felt the love but didn't know how to express how they felt to someone else. And now it's as easy as, "OK, let me play them this song to tell them everything that I wanted to say to them." Finally today, maybe you graduated this month, maybe you didn't, maybe you feel really confused about life right now about life, love, who you want to be. Maybe that just means you are a teenager. And if so, Khalid has your anthem. KHALID: (Singing) Send me your location. Let's focus on communicating 'cause I just need the time and place to come through. MARTIN: That is "Location" from Khalid Robinson's debut album "American Teen," and he wrote that song when he was a senior in high school. That's just one reason he's been called a pop prodigy by Rolling Stone magazine and counts people like Sir Elton John among his fans. But another reason, though, is that while his lyrics are very much of the moment, the themes - belonging, love, loneliness, loss - are timeless. KHALID: (Singing) So don't take advantage. Don't leave my heart damaged to understand that things go a little better when you plan it. MARTIN: And even though Khalid's album is blowing up the charts, he hasn't gotten too big to credit his biggest influence, his mom. She is also a singer. She performed with the U.S. Army Chorus. And when we heard that, we asked if we could visit with both of them together. And Khalid - yes, he does just use one name - is on tour. He's with us from his hotel room in St. Louis. Khalid, welcome. Thanks so much for joining us. KHALID: Thank you for having me. MARTIN: And Khalid's mom Linda Wolfe joins us from member station KTEP El Paso, Texas, Linda Wolfe. Mom, thank you so much for joining us. LINDA WOLFE: Well, thank you. I appreciate it. MARTIN: And congratulations on all of your son's success. I'm going to give you credit. MARTIN: So, Khalid, let me start with you. You are on tour right now. And I know - well, as an Army kid, you're used to moving around a bit, but I have to ask, though, is it a little bit hard to be away from home? KHALID: It does get a little bit stressful because when I used to move around, I moved around with family, now moving around alone. A lot of the friends that I have back home, too - we're kind of disconnected a little bit. But I just can't wait until I have this show in El Paso in around two weeks. MARTIN: Well, you didn't live in El Paso that long, as I recall, right? I mean, isn't that part of what motivated the album? Do I have that right - I mean, that you had just gotten transferred there in your senior year which is kind of tough. Was it junior year or senior year? I forget. KHALID: It was my senior year, and it was very tough. But I felt like it just gave me a sense of realization that I needed was just the fact that a lot of things that we surround ourself with are temporary only if we allow them to be. A lot of the old friends that I had in New York were temporary, and they fell off. But I met a lot of lifelong friends in El Paso who helped me be in the career that I am right now. If I didn't move to El Paso, my life wouldn't be where it is right now. MARTIN: Why do you think that is? KHALID: Because the moment that I moved to El Paso that drive of just loneliness really allowed me to just find comfort within myself. And when I found that comfort within myself, I began writing. And when I began writing, I began singing my own songs and El Paso's really responsible for that. KHALID: (Singing) Living a good life full of good vibes. My eyes are on the grey skies saying I don't want to come home tonight. Yeah, and I'm high up off what? I don't even remember. But my friend passed out in the Uber ride. I'm from the city of the 915 where all the girls are pretty and they're down for the hype. MARTIN: Let's turn to you - haven't forgotten about you here. Did you know all this was in him, this gift, these thoughts, these ideas - did you know that was in him? WOLFE: To an extent. I knew that he was, you know, very gifted vocally. You know, I knew that he was a very smart and bright kid. But the writing skills - I didn't know that he had that. DNA is a powerful thing. WOLFE: And I'm so, so, so proud. I mean, just sitting back here just listening to him and how he just describes his journey. I can see his growth. MARTIN: And he's also very honest. Let's play "18" shall we? And talk about that. KHALID: (Singing) Woke up a little too late this morning, but I think I'll be OK. I'll be OK. Damn, my car still smells like marijuana. My mom is going to kill me, going to kill me. MARTIN: Khalid, anything you want to share? KHALID: ...When I moved out of the house. KHALID: And my mom and I, we have trust within each other because at one time in our life, we were kind of all that we had. And so she let me go out. I didn't really tell her everything that I was doing when I went out, but my mom always knows. I'm pretty sure she knew that I was going out. I was having fun. I was doing stuff that I shouldn't be doing. But as long as she trusted that I was responsible and I was going to make the right decisions, I feel like that's all that really mattered. MARTIN: Linda, anything you want to - when you hear this song especially if you hear it on the radio, do you go, oh, boy? WOLFE: (Laughter) No. I definitely cherish the relationship that I have with my son, and I raised him to be self expressive and to make good choices. So he was very, very smart to not let me find out he was doing all those things that he was doing. So he made smart choices at the time. MARTIN: Khalid, there's something you wrote in the pamphlet to the album that I wanted to read. You said (reading) I sing with the voice of individuals who have a hard time expressing how they feel. The individuals who are just like me, not necessarily because they don't know how to express themselves, but because they're afraid no one will listen. That's quite a statement. Where did that come from? KHALID: So for me when I grew up, I had never really had an outlet when it came to my social surroundings. And I felt like when I wanted to talk to either if it was teachers, a lot of the teachers wouldn't listen to my problems because I felt like a lot of people thought that just because I was young that my problems weren't problems. I felt like a lot of people keep the fact that you know what? Like youth, you know - they're not really going through anything because they're not 25 yet. But at the same time, a 25 year old can go through the same form of heartbreak as a 35 year old and as a 15 year old, you know? Love crosses all boundaries. And so I felt like it was necessary for me to talk about the problems that I went through when it involved love, not only just to speak to people who were young, just to speak to people in general, people who who felt the love, but didn't know how to express how they felt to someone else. And now it's as easy as OK, let me play them this song to tell them everything that I want to say to them. KHALID: (Singing) As time passes, I feel so low searching for pieces, covering up the holes. I'll fight for your love. I'll fight for your soul. I'll throw all of my cares away for you. I'll be there to wait for you. MARTIN: Before we let you go, Linda, I wanted to ask is there a song that you and Khalid like to sing together, since both of you are singers? Did you ever do that? Did you sing at home? KHALID: Oh, we have tons. MARTIN: Really? Give us a little sample. WOLFE: What are you thinking, Khalid? You want to do SWV? KHALID: Are you taking lead or am I taking lead? WOLFE: (Laughter) I'm taking lead, of course. All right. Here we go. (Singing) I get so weak in the knees. KHALID: (Singing) Weak in the knees. WOLFE: (Singing) I can hardly speak. KHALID: (Singing) Can hardly speak. No, mom, you're doing it wrong. WOLFE: No. What are you doing? You're doing it wrong. KHALID: You're in a different key. KHALID: You're definitely in a different key. WOLFE: ...Key if I started it? WOLFE: (Singing) I lose control. KHALID: (Singing) And something takes over me. KHALID: I forget the rest (laughter). MARTIN: That was nice though. We got to hear the two of you together. Well, thank you both so much. Mom, since your son's so busy and travelling around and - do you have any advice or mom words for him before we all go our separate ways for today? WOLFE: Thank you for that. I just want him to get the rest that he needs. I know he loves his fans, but he just needs to get as much rest as he possibly can so - and call mama more. MARTIN: That was Linda Wolfe, her son Khalid Robinson's debut album is "American Teen." They were both kind enough to join us. Khalid is in St. Louis. Mom is in El Paso, Texas, their hometown. Thank you both so much for speaking with us. WOLFE: Thank you for having me. KHALID: (Singing) You've been here before surrounded in the cold. You take me to places I've never known, and you push me to places... Transcript provided by NPR, Copyright NPR.